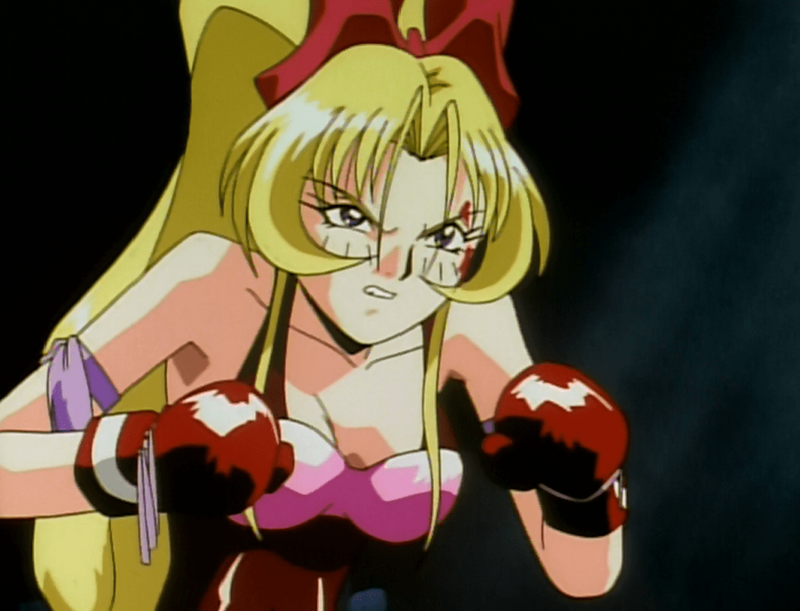 Ayane’s High Kick is a short-lived OVA series produced by Nikkatsu Corporation that was originally released in 1996. It was cancelled after only two episodes were produced, most likely due to an inability to attract a significant audience. But before we get to the reasons why, what exactly is it? Well, Ayane’s High Kick is a comedic sports anime, and a very genre-typical one at that. The plot centers around Ayane Mitsui, a high school student who, like many girls her age, has big dreams. Hers just happen to involve turnbuckles and body slams. Ayane’s greatest desire is to become a professional wrestler and take on her idol, Manami Toyoda (a very thinly disguised anime incarnation of real-life Japanese wrestling star Manami Toyota). However, her dreams get a reality check when she botches her audition for a pro wrestling promotion by flying out of the ring and smashing into the judges’ table. And also into the judges. But while she failed her audition, Ayane did catch the eyes of Kunimitsu, a sketchy character that offers her the chance to train at his gym and start her pro career the hard way. Only there’s a catch. Actually, there are several catches, and Ayane, as focused on her dreams as she is, doesn’t stop to question any of them. Questions like, why is he so focused on developing her kicks and not teaching her how to grapple? Why is her first scheduled opponent a kickboxer? And of course, why is Kunimitsu’s gym just a ring constructed in the open air under a freeway? Seems like a trustworthy fellow. Too thick to question any of the obvious, neon-lit warning signs staring her in the face, Ayane doesn’t realize that Kunimitsu has duped her until she’s standing in the ring for her debut match. As a kickboxer. In full kickboxing regalia. To be fair, Kunimitsu never said he was training Ayane to be a wrestler. So no, Ayane isn’t the sharpest tool in the shed. But forced to fight in a sport she has no interest in, she takes a beating while her friends look on in dismay. But in the final round, after taking a point penalty for delivering a German suplex to her opponent, she manages to score a victory by KO thanks to the training that Kunimitsu had drilled into her. 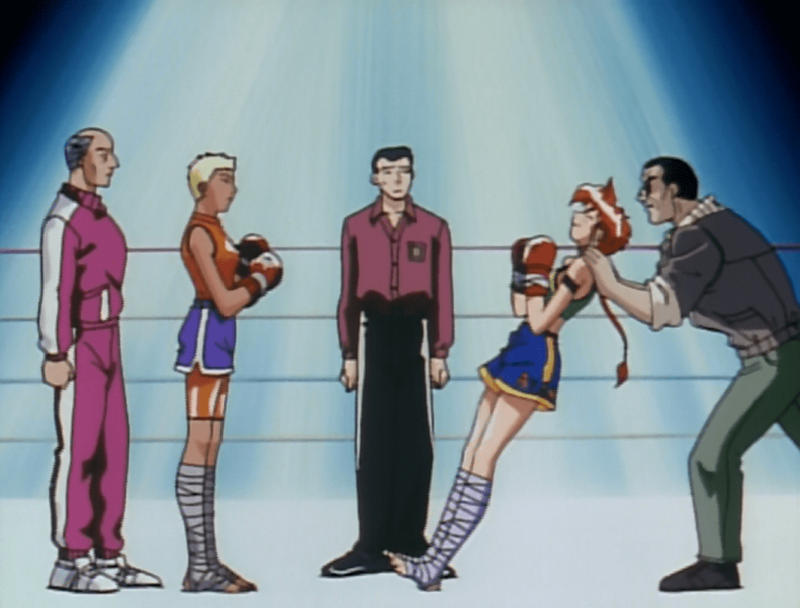 Overnight, Ayane becomes an unwilling kickboxing sensation. But while she’d like nothing more than to forget her kickboxing training and go back to wrestling, her performance catches the attention of Sakurako Miyagawa, the arrogant, absurdly wealthy heir to a massive corporation with a perfect kickboxing record. 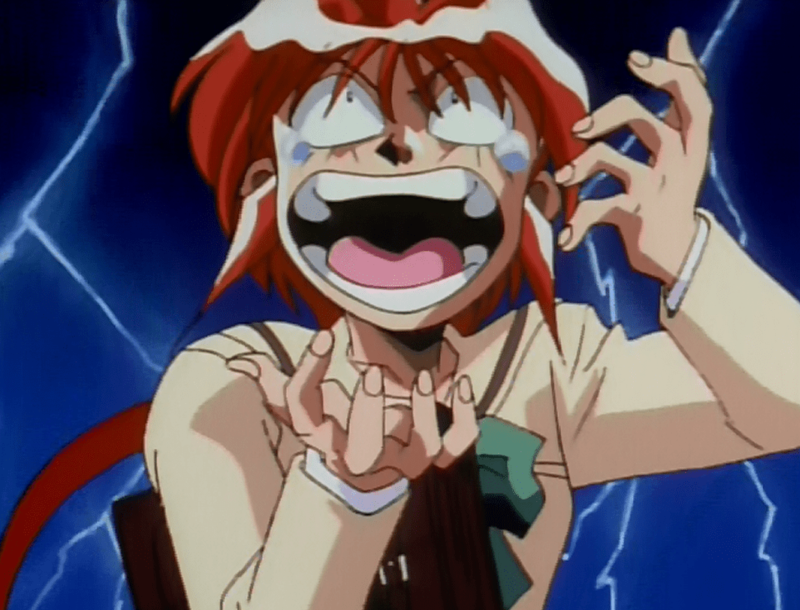 Enraged that an upstart stole the spotlight from her, she hatches a plan to make Ayane her next opponent. Through an absurd series of events involving Sakurako’s meeting with Kunimitsu, the subsequent plotting of Ayane’s shrill, vindictive vice principal to expel her on the technicality of engaging in an unauthorized part-time job, and the intervention of her kindly, if overly-understanding principal, Ayane is faced with an ultimatum. If she fights Sakurako and wins, she’ll be able to stay in school and graduate. If she loses, she gets kicked out of school. That’s Sakurako on the left, looking smug and ready to OH hohoho! her way to victory. Following a montage in which Ayane trains the old-fashioned, Rocky-like way of blood, sweat, and tears while Sakurako utilizes the best technology and technicians that money can buy, it’s fight time. And Sakurako proceeds to manhandle Ayane for the first two rounds. But like any good (if stereotypical) underdog sports story, Ayane comes back in the final round, determined to win so that she can graduate with her best friend Kayoko. She scores a victory by technicality, opening a cut on Sakurako’s forehead that forces the fight to end. But a win is a win, and Ayane is able to stay in school. Despite the victory, however, Ayane knows that she only won because of the technicality, and Sakurako has vowed revenge. Even so, Ayane is ready to once again go back to her normal life. Which is just when Kunimitsu surprises her with the news of her next fight. And that’s where the story ends. But in all fairness, while Ayane’s High Kick concludes with obviously more story to tell, what story is there does form a complete narrative of sorts with her being able to stave off expulsion. So unlike Fire Emblem, for example, it doesn’t feel like anything of importance is missing. The main problem it has is that, as far as sports anime and underdog stories are concerned, it’s a very by-the-numbers affair. It’s not hard to guess how the rest of the story might have played out had the series been allowed to continue. 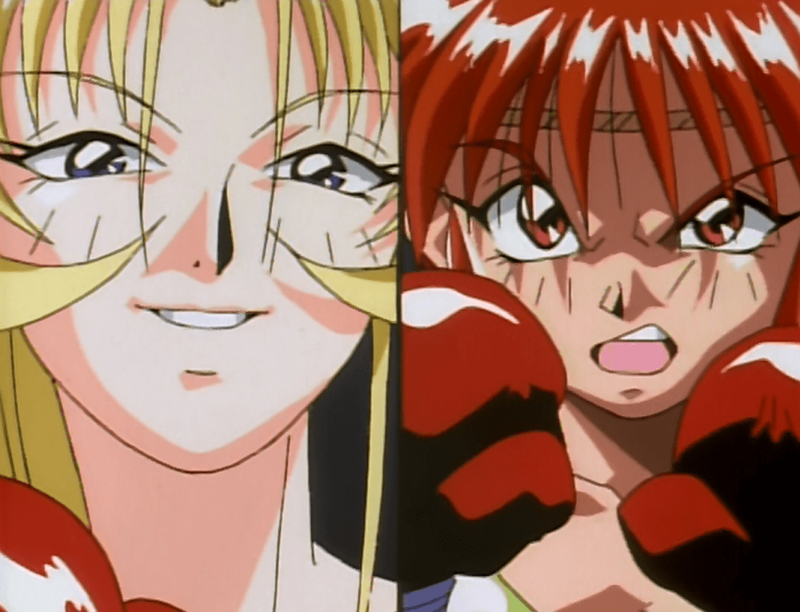 Ayane would likely have continued fighting and training, and ultimately would be forced to choose between her dream of becoming a pro wrestler versus her greater talent as a kickboxer and her inevitable rematch with Sakurako. But predictability and simplicity aside, Ayane’s High Kick isn’t without its entertainment value. The characters are all drawn in broad, archetypical and stereotypical strokes that are easy to identify, whether it be Ayane in her single-mindedness, her friend Kayoko being the inexplicable polar opposite of Ayane in every way, or Sakurako being more or less a kick-boxing B-ko. But though the cast suffers from stock character syndrome, they work well together, and more importantly, the humor is largely amusing. 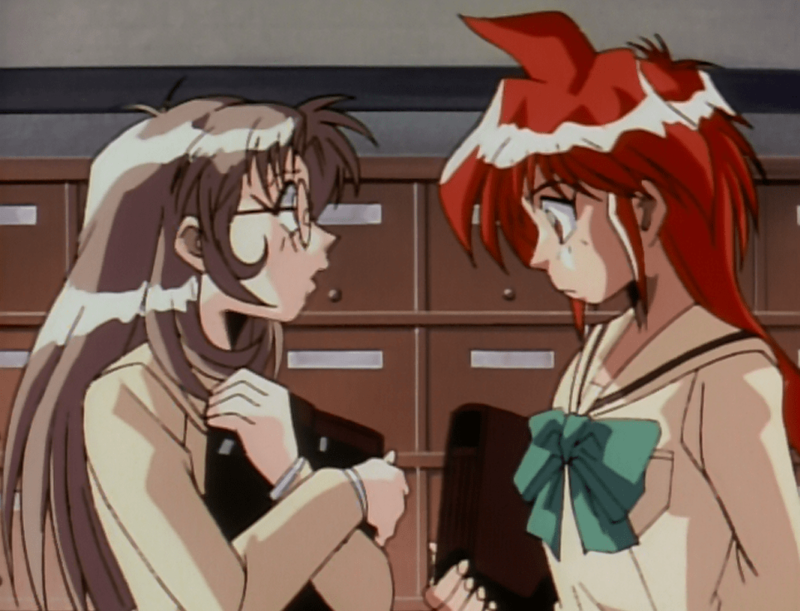 Kayoko provides Ayane’s moral support in training. It also helps that Ayane is enjoyable as the reluctant protagonist. Unlike most sports stories of this type, Ayane isn’t where she is by choice, and even in her success she finds her predicament more of an annoyance than anything. Yet her abilities as a kickboxer far outclass any talent she demonstrated in wrestling, and so even in her dismay, she’s able to find some measure of undesired thrill in it. She’s also entertainingly voiced by Yuko Miyamura, who more people may recognize as the voice of Asuka from Neon Genesis Evangelion (or perhaps from her appearance as the training video girl from Battle Royale). With a breezy running time of an hour, Ayane’s High Kick doesn’t overstay its welcome. Its formulaic nature and simple characters make it easy to forget, but that’s not to say that it isn’t entertaining. Just like Ayane herself, it’s prone to taking the simplest, straightest path without putting much thought into it. 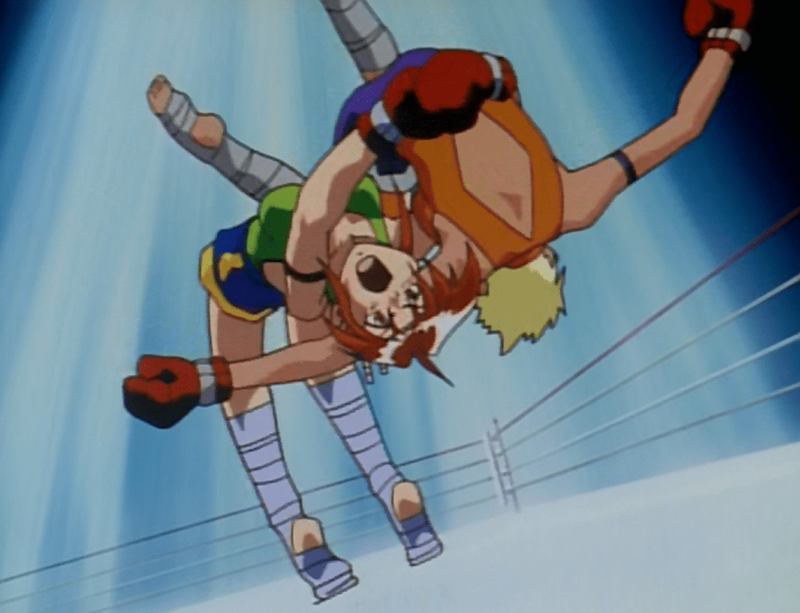 Ayane’s High Kick was released on DVD in North America by U.S. Manga Corps, a Central Park Media label. 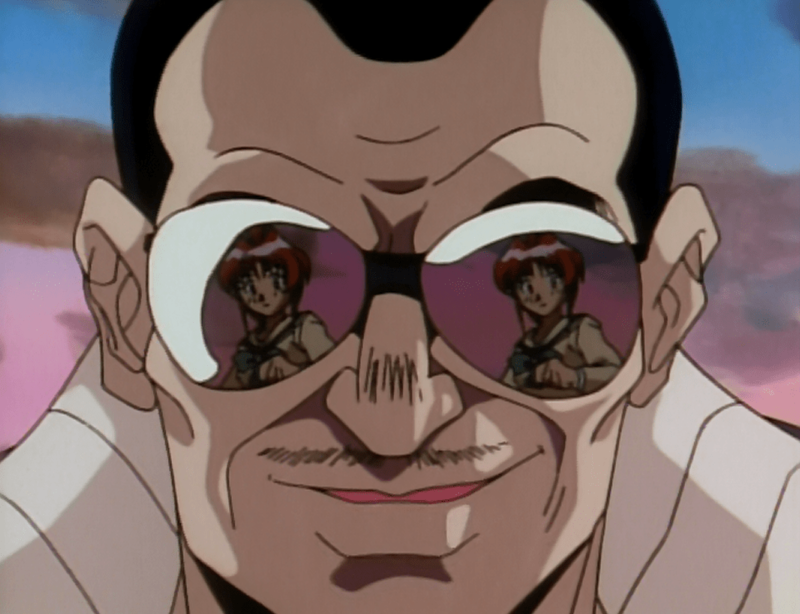 The release contains both the original Japanese with subtitles and an English dub. It is recommended for ages 3 and up by the publisher, and contains violence.